The stars do look very different today as the world mourns the loss of one of music’s most colourful characters. 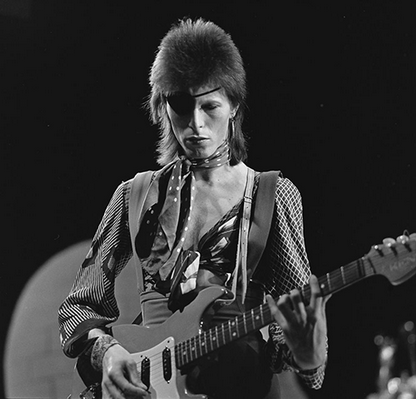 Chart-topping singer, songwriter and actor, David Bowie has been described in obituaries as a trail-blazing musician, a master of re-invention, a glam-rock pioneer, an enigmatic provocateur and a creative genius. Last Friday, on his birthday and just two days before his death to liver cancer, he released his final album, Blackstar. ‘Bold and weird’, according to The Telegraph’s music critic, Neil McCormick, the album is the culmination of an extensive musical legacy which will be enjoyed by generations to come. According to those closest to the star, Blackstar was quite deliberately produced as his final swan song and imagery and references to death appear throughout the collection of songs. That he produced, a requiem of his own death as a parting gift to his fans demonstrates remarkable foresight and a willingness to prepare for the end. And no doubt the creative genius who was responsible for Ziggy Stardust also leaves behind a tidy financial legacy as well. A highly intelligent man who battled with cancer for 18 months, albeit in private, Bowie no doubt had the astuteness and the time to get his financial affairs in order by writing a will to ensure that his wealth and assets would be left to those he loves. The family he leaves behind include his Somali-born supermodel turned political science major and successful businesswoman wife, Iman, who he fell in love with at first sight, claiming he was ‘naming the children the first night we met’, their daughter, Lexi, who is just 15, his son, Duncan, from a former marriage and his stepdaughter, Zulekha. This family set-up is far from unusual but provides some second marriage complications when it comes to inheritance. The fact is that the only way that the man formerly known as Davy Jones could be sure that his wealth would be divided up according to his wishes was to make a will. No doubt he would also have wanted to plan his sizeable estate to keep the taxman’s hands off as much of it as possible and sought the assistance of professionals with the knowledge and expertise to enable him to make some wise decisions in that regard. While your own wealth might not be in the same league as Bowie’s, I’d urge you to do the same. You might not be living under the shadow of death as he did for his final months but none of us knows when our time will be up. Planning for your own demise by making a will to ensure that your money goes where you want it to, and using the tools at your disposal to minimise death tax is really important for the financial future of those that you love. That applies whether you are an average Joe or an innovative genius and musical icon whose creative legacy will live forever.